the coaster brake: I'd forgotten just how much fun they are, although it does make kerb hopping a dangerous activity if you forget! interesting bike, although I can't help feeling that the Ute has a bit more capability as a load carrier. it would interesting to find out how many of them have actually gone to Africa? Dave, we should have a race, TT the Africa Bike and Ute up your commute hill with a combination of luggage. Perhaps build the Worlds heaviest bike? Perhaps build the World's heaviest bike? Surely that's going to be some battery assisted behemoth? Hey Dave, my girlfriend wants to know what the front basket looks like? 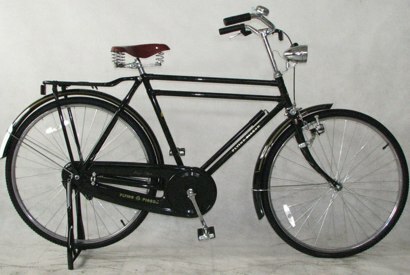 I think I may have persuaded her to get one of these rather than a Pashley Princess. A Pashley Princess is a beauty to behold though, I really wanted to get Mrs. DaSy one just so I could justify a Roadster Sovereign to go with it. She eventually decided against it, much to my dismay! So, what you're saying is "heavy bikes can go up hills too"? Seeing as the Velorbis Scrap Deluxe is a positively trim 38 lbs, I reckon I'll be flying up the climbs if/when I get hold of one.